In an announcement earlier this month, ChessOK introduced a new member of the Aquarium family: Houdini 2 Aquarium. It’s actually a group of products comprising Houdini and Aquarium, available both in a single package and as separate products. 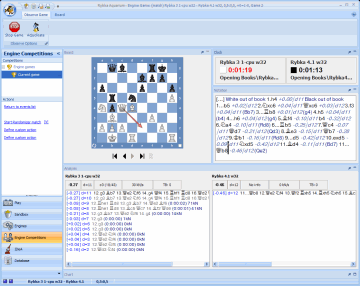 As chess players know by now, Houdini is currently the highest rated chess engine and the new Aquarium version is an even better analysis tool than previous versions. Best of all, the new Aquarium version will be available as a free update for current Aquarium 2011 users. In this column I describe various methods of sending games and positions to IDeA. In addition to (or instead of) letting IDeA choose positions to analyze, you let it analyze the positions that interest you. Convekta/ChessOK is glad to announce the release of the latest updates for Aquarium products. It is highly recommended to download and install these updates as they include a set of important new features. It is especially important for Aquarium 2011 users, as they receive the full set of features implemented in Houdini Aquarium. This month I take a brief look at the Aquarium 2011 directory structure. A general understanding of where Aquarium files are stored is useful for performing various tasks, such as backing up important data, and transferring databases and trees from one computer to another, etc. It also helps you to find the most appropriate place to store your personal databases, analysis trees, etc. within the Aquarium directory structure.